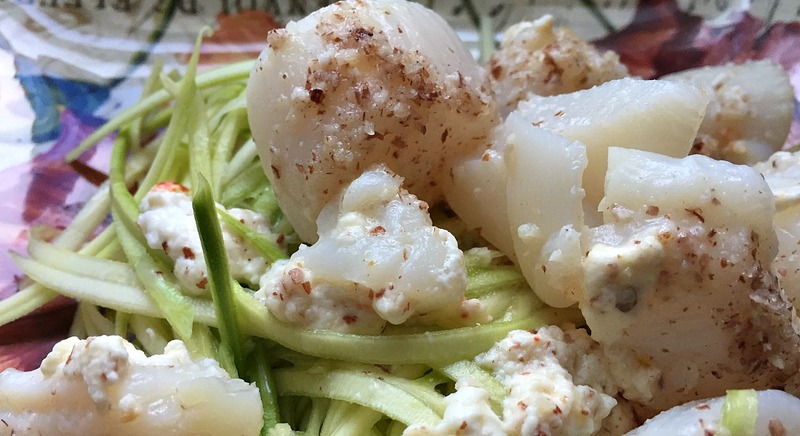 Sea scallops, saffron, creme fraiche, and zucchini – yum – what a fab combo! This gratin is quick, tasty and wildly versatile. Arrange scallops in small baking dish. Combine creme fraiche, saffron threads, zest and sea salt in small bowl. Toss with sea scallops. Sprinkle a layer of hazelnut meal (or breadcrumbs or Parmesan) over scallops. Meanwhile, wash and peel zucchini and discard the outer skin. Using a julienne peeler (or continue using a regular swivel peeler), peel lengthwise strips until reaching the seedy cores. Arrange zucchini “noodles” on plate(s). In case you are wondering why I introduced this dish as “versatile” – well – skip the saffron and use basil, parsley, curry, or cinnamon – just about any spice or herb you wish – and you’ll create a fabulous dish! What treasure does your spice cabinet hold that will elevate this dish? Leave me a comment, I’d love to hear about what deliciousness you create.